My publisher may be called “Damnation,” but I felt pretty blessed when I was asked if we could produce the audiobook version of I Left My Brains in San Francisco. I think my Neeta Lyffe novels are great for listening to, and I loved working with voice talent Becky Parker on Neeta Lyffe, Zombie Exterminator. She took what was already a hilarious story and made it even funnier with her voices and sound effects. (I shall never hear Unchained Melody the same again!) There was one stipulation: they wanted it done fast so they could promote it with an ad they’d already bought for Neeta Lyffe in October. We had only weeks! You know the saying, “Man proposes; God disposes”? I don’t know what God thinks of my zombie fic (I’d like to hope He gets giggles from it), but Audible has certainly disposed of my plans. My poor book is lost in the bowels of Amazon’s Audible! End result: I’m on a book tour with no book. Becky and I put a ton of work on this, and we have people reading our interviews and guest posts and wanting to get their hands on a copy. It’s not fair that this happened, but we want to do our best to be fair to readers. Therefore we are offering the first three chapters, free. 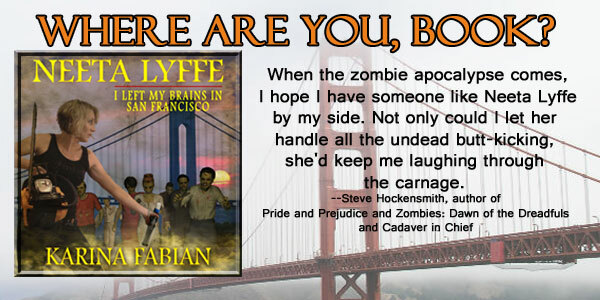 All you need to do is go to http://karinafabian.com/neeta-lyffe-zombie-exterminator-series/ and sign up. (I’m a Luddite, so I need to email you the link.) In addition, anyone who registers gets a chance to win a free copy of the audiobook version of Neeta Lyffe, Zombie Exterminator. If you enjoy zombies, satire and fun with chainsaws, head over to my website now and sign up. While you’re there, click to the Neeta Lyffe series and enjoy the videos and excerpts, too. This entry was posted in Comedy, Fiction, Horror, News and tagged Free Fiction, I Left My Brains in San Francisco, Karina Fabian, Neeta Lyffe, Zombie Fiction. Bookmark the permalink.